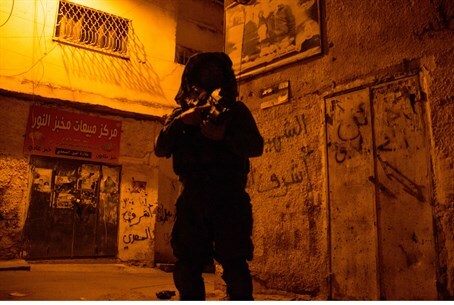 Another nine wanted terrorists were arrested Thursday night as part of the Operation Brother's Keeper crackdown on Hamas in Judea and Samaria, and 40 more locations were searched in the efforts to rescue the three kidnapped teens. Over the course of the night's search several incidents of violent friction with local Arabs were reported. A senior IDF captain said that two pistols were seized at Bitunia near Ramallah in Samaria, reports Walla!. Additionally, explosives were discovered and seized in the Arab village of Idna to the west of Hevron. The identities of two Hamas terrorists from the Hevron area who were behind the kidnapping were announced on Thursday night by the IDF. Another senior IDF source said "we were partners in the decision to publish the names of the suspects responsible for the abduction, and it doesn't directly affect our actions (on the ground)." The father of one of the Hamas kidnappers responded Thursday night by denying his son's involvement, even as he admitted that he hadn't seen or heard from him since the night of the kidnapping. The operations continue in the Hevron and Gush Etzion areas of Judea, despite a Security Committee decision Tuesday to scale back the operations for the Muslim holiday month of Ramadan, which starts this Saturday. After the mothers of the three teens gave an impassioned speech at the Knesset on Wednesday, criticizing Prime Minister Binyamin Netanyahu and decision makers for taking "irresponsible actions," the Security Committee reversed itself on Wednesday night. "The IDF decided to continue to maintain the scope of the large forces in the Etzion and Judea region, and the 900 Brigade is doing most of the work in the field along with other units that reinforce the Brigade all the time," said a senior IDF captain on Thursday.